What is cuter than a baby wrapped in a crochet blanket? Not much. 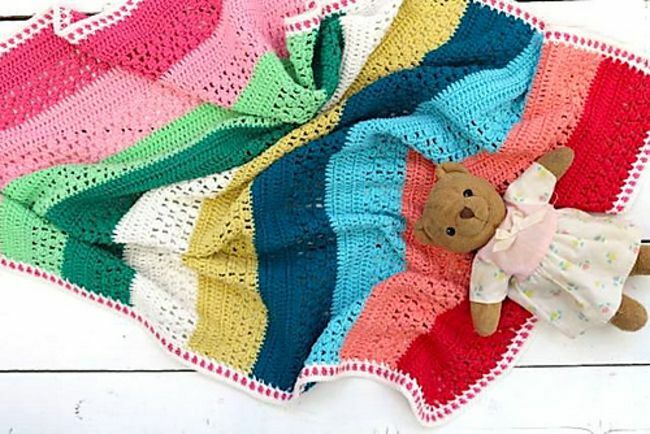 You'll agree when you see these top crochet baby blankets. You will find patterns in different colors and styles, suitable for both boys and girls. They can be created as gifts and are also perfect to donate to hospitals and charities. Most of these crochet blanket patterns also work as lapghans, so you can gift them to nursing homes, not just to babies. This baby blanket is easy enough for total beginners to crochet. That said, it's still a great pattern for advanced crocheters. It works well when ever you need a fast baby blanket crochet pattern. Maybe there's a last minute baby shower or you're behind on your Christmas crafting; this is a blanket that works up quickly. This is worked in single crochet stitches combed with chain stitches. It has a nice dense texture, and it is meditative to craft. It comes with instructions for three sizes - ranging from newborn to toddler - so make this for any little ones that you know. Do you want a crochet blanket pattern that's even easier than that first one? Try this blanket. It's made entirely in single crochet. It uses a large size P crochet hook combined with bulky weight yarn, so what you get is a quick blanket that beginners can easily crochet. It is designed as a 36" square crochet baby blanket, but you can adapt it to any blanket size. "Today I am a mermaid. Tomorrow I will be a unicorn." The words are spelled out using crochet bobble stitches. These also create great texture for baby to grab onto when holding this blanket. This crochet blanket is made from a simple set of nine basic crochet granny squares. What makes it so unique and special are the color choices for each of the squares, which are explained in the free tutorial. Lovey blankets are a perfect choice for babies. They combine the soft warmth of a crochet baby blanket with the huggable adorableness of an amigurumi animal. There are many different types of animal lovey blankets; they are often popular Easter crochet patterns featuring chicks, bunnies and lambs. This elephant crochet lovey is based on a crochet granny square. It's a terrific gift for a baby's first birthday. This is a smart crochet blanket design that combines the corner-to-corner crochet stitch with the chevron graphic design to create a really beautiful afghan. The incorporation of yellow stripes makes it especially cheery for nurseries. This is just one example of a great ripple crochet baby blanket for babies. Corner-to-corner crochet can also be used to create baby graphghans. Repeat Crafter Me has many fun graphghan designs including this polar bear cub crochet blanket. What baby wouldn't adore something like this - and as a bonus it looks extra cute in Instagram photos! C2C crochet can also be used to make small squares that are combined together to construct a baby blanket. This one has a repeating pattern of foxes in different colors. Cover baby up in a garden of crochet roses with this textured baby blanket pattern. This is a beautiful pattern that makes a great heirloom piece. This crochet blanket is made up of a combination of simple solid squares and very subtle floral afghan squares. The flowers are created with strategic spacing. A textured border and a few color changes make it really pop. It's a very sophisticated design that works nicely for adults as well as for use as a baby blanket. This crochet baby blanket uses a combination of solid and open crochet stitches for a fabulous design. This one is really fun to craft. Color changes create thick stripes for a blanket that will delight baby's eyes. This pattern is written in both US and UK crochet terms. This crochet blanket pattern combines the basic single crochet with chain stitches to give you the nicely textured, but still very easy, granite stitch. Add in some smart color changes for striping and you have a beautiful blanket. This pattern includes instructions for multiple blanket sizes; you could make mommy-and-me blankets. Baby will be cozy beneath this super squishy crochet baby blanket. Puff stitches crocheted with a large hook make for a relaxing project. The texture is fabulous to the touch. Work it in any color that baby prefers. This crochet blanket is designed with "puffy patches" that create a quilt-like texture. Pastel crochet is a great choice for babies. This blanket fits perfectly inside of a crib or playpen. Many crochet baby blanket are designed with simple stitches, but that doesn't mean that simple is the only way to go. Get the pattern for this colorful, detailed crochet square that uses advanced stitches for an intricate look. Make as many of the squares as you want to join together into the baby blanket size desired.